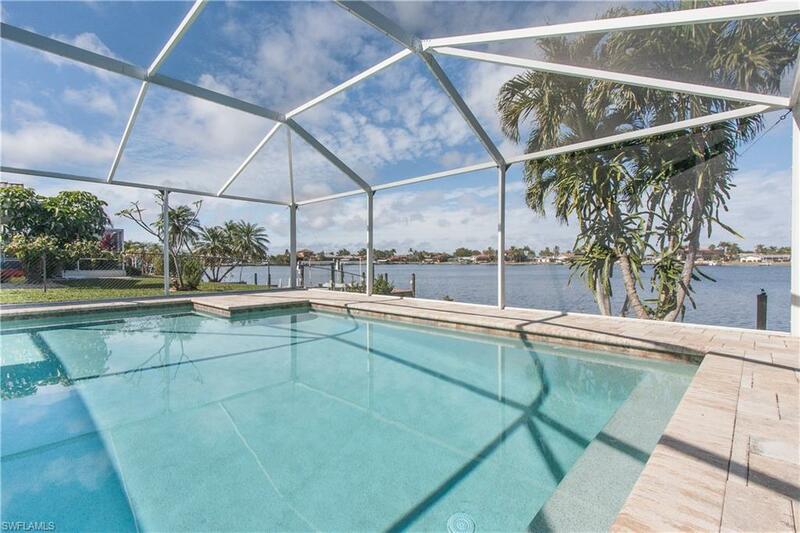 411 SW 53rd Ter, Cape Coral, FL.| MLS# 219002622 | Southwest Florida Residential Real Estate for Sale. 2014: New pool and pool deck, solar heated, salt system; 2018: New roof; 2016: New a/c (condenser and air handler); 2017: New water heater; 2017: New dish washer; 2018: New washing machine and dryer --- Large new pool area with two covered lanai areas and tanning areas; outstanding lake view, great sunsets, quiet street (cul-de-sac) with lake front properties on both sides of the street, valuable southern 8-Lakes area, walk to Rotary Park --- 4 bedrooms, 1, 911 sq. ft. under air --- bright great room with large glass sliding doors towards pool deck, updated open kitchen --- Wonderful fruit trees --- Gulf access: Beautiful boat ride through the Rose Garden area, only 25 minutes to the river.